What if…A woman wins a $19 million lottery and returns to her hometown, only to find herself the primary suspect in the murders of four blondes. Can she prove her innocence and solve this case before it’s too late? One day, I received a phone call from a former colleague. While reminiscing about the past, I recalled an incident from my early teaching years. Circa 1982: I had just started a short-term placement in the mathematics department of a large composite high school. My timetable wasn’t a good one, and I gathered the other women in the department hadn’t fared much better. The men outnumbered the women in a ratio of 3:1 and dominated most of the conversation at the monthly meetings. But as the semester drew to a close, three of the older women became more emboldened and started voicing their concerns. Legitimate concerns about timetables and room allotments. Surprised by these outbursts, most of the men shrugged and said nothing. The department head glanced at his watch and started shuffling papers. But one senior male teacher in his sixties couldn’t contain himself. He stood, and shouted: “There are too many women in this room! And that’s why we’re having problems in this department.” He threw his binders on the table and stormed out of the room. “Or any man born before 1950,” another woman added. I don’t recall too many other details about that short teaching placement, but the older gentleman’s outburst has stayed with me. 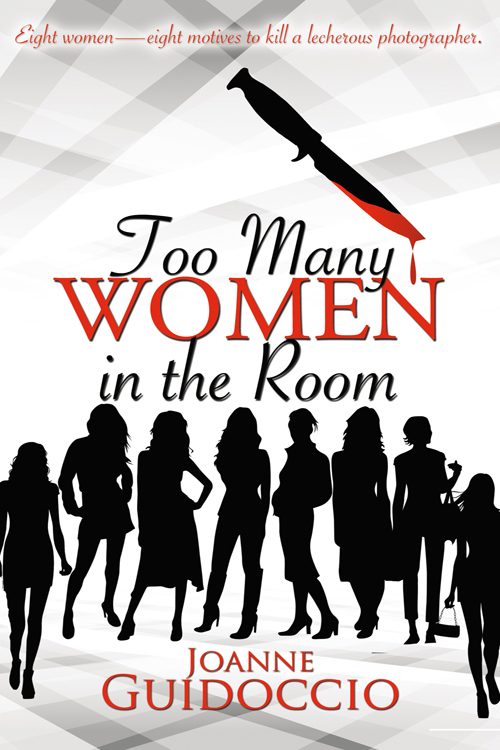 And provided the perfect title for Book 2 of the Gilda Greco Mystery Series: Too Many Women in the Room. Postscript: In 2008, I retired from a mathematics department that was predominantly female. I also had the satisfaction of knowing I had positively influenced many young women to pursue mathematics, business, and science careers. Wonderful to get behind the scenes and see how a spark ignites into a novel. Best of luck. This is such a great series!!! I can't wait for book 3!!! Write faster, Joanne. Good to see you here, Peggy. Book 3 will be out in the spring.As for writing faster...I write at tortoise speed. Am enjoying your book very much! Good to see you here, Sandra. Happy reading! Love this series! Interesting hearing how it all came about, congrats, Joanne! I enjoyed reading how you got your inspiration for the book. The title is spot on! Great excerpt and book trailer. Congratulations. Thanks Cat! I can't write until the title gels. Working titles don't work for me.